A good choice of plants will give you much pleasure later on. When you choose your plants wisely, you will need just a little maintenance and you will constantly have flowers in your garden. Thanks to our large assortment, you can always find suitable plants. Your garden centre can help you in this regard. Loosen the soil and mix in the top layer of 10 cm one bag of Hello Garden soil improvement agent per 5 plants. Beware: NEVER plant the plants directly in the soil improvement agent, you always have to mix thoroughly. Make a wide planting hole, twice as wide and 1 cm deeper than the root ball. Remove the pot by squeezing the sides lightly, while holding the plant just above the ground. Hold the plant upside down und shake lightly to make the root ball fall out. Do not pull too hard at the stalk of the plant. Put the root ball in the ground, fill the hole with the remaining soil and press gently. During a dry period in the week after the planting you have to water the plant three times generously. 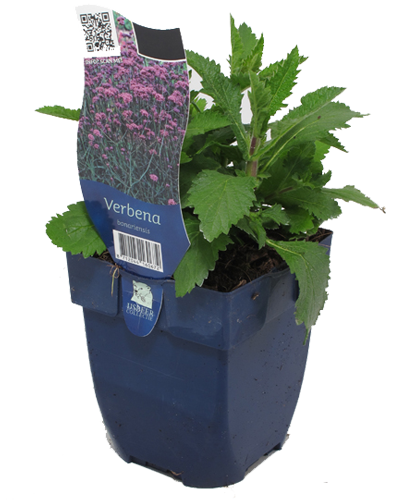 There exist approximately 800 different types of Hello Garden perennials. These are selected by growth and blossoming abilities. Furthermore these plants can be maintained quite easily and they are not very sensitive to diseases. Every type does, however, need some degree of care in order to grow optimally. For the best result, you should follow the instructions below. Do you have some questions regarding a specific type? Contact your local garden centre. After planting, you should water your plants sufficiently. Try to limit this in a later stage as much as possible. By watering the plants regularly, you will make them “lazy”. In longer periods of drought, water the plants preferably a few times generously. This is better, than watering regularly in small amounts. Plants in pot do need regular watering, of course! Directly after planting, fertilizing is not necessary. The plants draw sufficient nutrients out of the potting soil. If you want to fertilize your garden in a later stage, please read the instructions on the packaging of the fertilizing agent very thoroughly. Wrong application of fertilizer can be harmful for your plants, especially with the use of artificial fertilizer. The exact cutting instructions differ from plant to plant. In general it can be said, that you should cut your perennials directly after blossoming. The removal of flowers after blossoming prolongs and enhances in general the richness of the flourishing. You don’t have to prune your plants. Ornamental grasses and dry flowers/stalks often look very decorative during winter time. Furthermore they give an adequate protection against frost. Remove possible dry remnants every spring, before the plant sprouts again. Certain plants grow wide very quickly. When plants become top wide, you can cut them with a shovel or hedge shears. Large plants can be dug out as well, divided into two and replanted. Almost all the Hello Garden plants do not freeze to death in the European climate. Less hardy plants can be protected with a layer of leaves or another kind of cover.